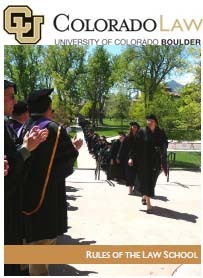 Colorado Law is a part of an Association of American Universities' level-one research university and therefore offers rich opportunities for interdisciplinary study through seven dual degree programs with other University of Colorado schools and colleges. These dual degree programs offer students a way to integrate their study of law with other disciplines while earning course credit towards both degrees simultaneously. The Law School works in cooperation with these other schools to design and select courses in each program that allow students to earn a dual degree in less time than it takes to earn each degree separately. Students apply separately to and are admitted by the two schools under their respective admissions procedures and standards. Students may elect a dual degree program at the time of initial application to both schools, or they may apply to one school after having enrolled in the other; however, only credits earned after Law School enrollment count toward the JD degree. The Law School requires that students take the first year of the JD curriculum as a unit exclusively in the Law School. Find details of each dual degree program in the Rules of the Law School. Tuition rates and fees for each program vary, depending on whether the student is doing the dual degree at the University of Colorado-Boulder campus or at another campus. Students interested in pursuing a dual degree should contact the registrar's office and the relevant program advisor. This four-year program exposes students to constitutional, criminal, and contract law as well as economics, management, and corporate finance. Graduates with advanced legal and business expertise are extremely marketable as legal counsel to corporations, accounting firms, and insurance companies; securities specialists to financial institutions; and even CEO/CFO. In addition, graduates can specialize in shareholder relations, labor relations, real estate, business policy and general strategy, risk analysis, legislative relations, lobbying, international relations and trade, or intellectual property aspects of e-commerce and the Internet. Students interested in enrolling in the JD/MBA program should contact Professor Brad Bernthal. CU has nationally renowned programs in both environmental law and environmental studies. The master's is a four-year program and the doctorate is a five-year program. Students take courses in the core areas of the law and a range of natural resources and environmental fields that encompass the legal, policy, and scientific disciplines, including environmental law, water resources law, public land law, climate change law and policy, environmental philosophy, and environmental science. Graduates have the skills to impact future policies in government, industry, law firms, or non-profit organizations and confront issues in ecosystem management, water and air quality, policy development, mineral and oil mining, wildlife conservation, and public and private land ownership. Students interested in enrolling in either of these programs should contact Professor Mark Squillace. Students study the science of healthcare delivery and the legal and financial organization of the healthcare industry. The six-year program lays a scientific foundation for further medical education and begins to equip students for a lifetime of learning, research, clinical care, and community service. Special interests can include litigation, bioethics, public health, neurology, women's health, or pulmonary medicine. Careers can focus on medical malpractice litigation, managed care and health policy, governmental regulation, healthcare administration arenas, intellectual property issues in biotechnology, and environmental law and policy. Students interested in enrolling in the JD/MD program should contact the Associate Dean For Academic Affairs. This four-year program encourages an interdisciplinary education in government, public policy, and law, covering areas of public management, policy analysis, public finance, and human resources management. Through electives, students develop a specialization in nonprofit management, domestic violence, local government, environmental policy and management, and emergency management and homeland security. Graduates are prepared for leadership positions within public interest organizations, state or local government agencies, administrative agencies, and law firms representing public-sector clients, healthcare, and nonprofit organizations. Students interested in enrolling in the JD/MPA program should contact Professor Helen Norton. Students who want a more immersive experience may apply for the dual JD/MS degree program. In this four-year program, students choose from intellectual property, technology, and telecommunication courses, while emphasizing other aspects of telecommunications such as economics, business, and policy. Students develop a working knowledge of the law and its relation to communications and networking technologies in this high-technology age. Graduates are highly marketable in the areas of intellectual property, patents, or IT law, as in-house counsel in the high technology industry, and in government agencies dealing with high technology regulation.To apply, please read Rule 104 in the Rules of Law School (excerpt below). Students interested in enrolling in the JD/MS program should contact both the Law School Registrar Shannon Foley (LawReg@colorado.edu) and the ITP Program (itp@colorado.edu). Please contact Professor Blake Reid if you have questions or would like to learn more about the program. To be eligible for the JD-MS Dual Degree Program of the Law School and ITP, a person must apply separately to and be admitted by each of the two units, under their respective admissions procedures and standards. Each unit will make a provision in its admissions materials for an applicant to elect to be enrolled in the dual degree program, with the Law School listed as the primary unit and ITP as the secondary unit. Each unit will promptly inform the other of the admission of an applicant, who has elected the dual degree program, and may otherwise share information and coordinate admissions for dual degree program students. In order to accommodate the administrative requirements of ITP, the Law School will use its best efforts to assign a major code specific to the dual degree program, in addition to the Law School’s major code, upon student admission to the program. A student participating in the program is not eligible to pursue other dual degree programs with either the Law School or ITP, but may pursue certificates. A person may elect the dual degree program at the time of initial application to both units; or a student enrolled in the Law School may, during his or her first or second year of study under the degree program of that unit apply for admission to ITP and elect to be enrolled under the dual degree program. A student enrolled in ITP may during his or her first year of study under the degree program of that program apply for admission to the Law School and elect to be enrolled under the dual degree program. However, pursuant to American Bar Association rules, coursework previously undertaken by an ITP student in the Law School or in ITP shall not be counted toward fulfillment of the total number of credit hours required for Law School graduation if the student is later admitted as a regular student under the dual degree program. Students in this four-year program will learn constitutional, criminal, and contract law as well as root causes of urban and regional problems, urban spatial analysis, and planning methods. Courses will explain strategies that deploy policies, plans, resources, and regulatory approaches to create environments suited to human and ecological needs, and methods for evaluating the human and environmental consequences of urban problems. Graduate address issues at the interface of policy and law, emphasizing the use of land and real estate, and the management of the public lands and natural resources (including mineral and energy resources). Graduates who focus on local or global economic development and law will have unique perspectives on private enterprise, corporate regulation, labor markets, poverty, and international relations. Students interested in enrolling in the JD/MURP program should contact Professor Rick Collins. The Law School offers a program of law study that leads to a Juris Doctor degree with an emphasis in taxation. The program signifies tax law experience beyond that normally obtained by law graduates, but not as extensive as that obtained in a Masters of Taxation degree program. Students can complete the program within the normal three-year law degree period by planning the program of law study effectively and taking a summer session or a heavier-than-average load each semester after the first year. Law students who wish to participate to participate in the program should submit enrollment forms to both the program director and the law school registrar. Colorado Law offers certificate programs that demonstrate a completion of a concentrated course of study in a specific legal field. Certificates require at least 92 credit hours (89 are required for the JD), with at least 18 or 21 of the 92 hours in designated courses. Students can complete a certificate program within the normal three-year law degree period by planning the program of law study effectively and taking a summer session or a heavier-than-average load each semester after the first year. Law students who wish to participate in the program should submit enrollment forms to both the program director and the law school registrar. Graduate Energy Certificate Program – Administered through CU's Environmental Studies Program and the Renewable and Sustainable Energy Institute, the program has core requirements in energy science and technology, business, and policy, with an emphasis on renewable and sustainable energy. Students must take 18 hours of coursework: 9 for core courses, and 9 for electives. Law courses that qualify as electives include: LAWS 6712 – Climate Change Law and Policy, LAWS 6722 – Energy Law and Regulation, LAWS 7122 – Mining and Energy Law, and LAWS 7132 – Energy Insecurity and Sustainable Energy. Interested law students should speak to Professor Sharon Jacobs. JD students wishing to participate in this certificate program should be aware that no more than six of the nine core certificate class credits can count towards graduation, so participation in this program will require them to take more than the 89 credits normally required for the JD degree. Interdisciplinary Graduate Certificate Program in Environment, Policy and Society – Offered through CU's Environmental Studies Program, it incorporates courses from the Colleges of Arts and Sciences (Departments of Anthropology, Biology, Economics, Geography, Philosophy, Political Science, Psychology, and Sociology), Architecture and Planning, Engineering, and the Schools of Law, Business, and Journalism. Tracks are available in Environment and Society, Environmental Policy, Energy and Society, and Water and Society. Students must complete 18 credit hours of approved course work, including 6 credit hours of cornerstone/capstone seminars. At least 12 credit hours must be in courses outside the school/college/department in which the student is currently enrolled. Interested J.D. students should be further aware that participation in this program will require them to take more than the 89 credits normally required for the J.D. degree. Interested J.D. students should consult with law school Professor Sarah Krakoff and the law school registrar for more details.